I find it so interesting how much I crave for slower and simpler travels during the winter time. Is anyone else like that? I find myself yearning to go somewhere “off-the-grid” in the mountains to just relax and truly take advantage of the cooler winter months. Even though I’m hands down a warm-weather kind of girl, there’s always a part of me that enjoys the frigid mountain air in the winter time. There's just something about getting all snuggled up in the coziest blanket to enjoy the sparkle of the stars without any interruption from the city lights, and just stepping back to embrace the silence and peacefulness. Maybe it’s because the summer months always bring a season of “busy-ness” – work always seems to be busier, responsibilities and endless activities seem to pile up, and I always feel like I look back on summer and wonder where all the time went. To me, it feels like another way that God shows me (even in such a small way) how intentionally and thoughtfully he designed these seasons to be. It’s as if He planned the seasons out to make sure we're able to have a season during the year to slow down, rest, and reflect on His goodness...and that to me is just SO AWESOME. All that being said, even though it has recently been feeling a lot like Spring here in the Carolinas, it was fun to be able to sneak in a trip to this cabin to celebrate the last few weeks of winter. We were greeted by the (random), but perfectly cold weather to match this charming and cozy 450 sqft cabin in Glenville, NC. The cabin was in a great centralized location. The cabin is near Lake Glenville and several hiking trails, but is also located about 5 miles from Cashiers and 15 miles from Highlands for shopping and local restaurants - so even if it feels "secluded" and "private" there is still easy access for any last minute grocery-runs you might need to take during your stay. You can view the full list of recommendations here. 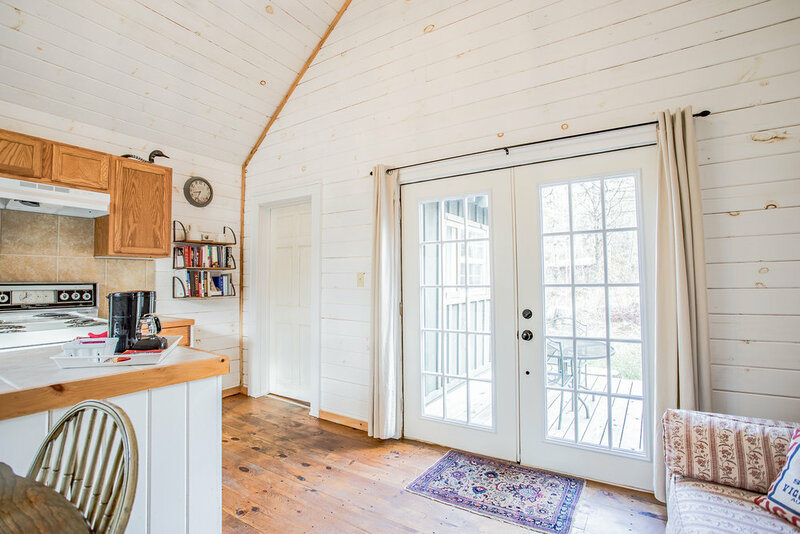 Even though the cabin is only about 450 sqft, the vaulted ceilings and beautiful whitewashed shiplap walls gave this place a “spacious” feel to it which made the space feel open, without losing its coziness. The natural light coming in throughout the cabin made the space feel more energizing which is sometimes hard to accomplish in small spaces - it was absolutely perfect for a winter weekend get away, and I definitely left feeling energized and inspired! It's all in the details...I don't know about you all, but I just love it when Airbnb hosts add a little character to their spaces. This particular host had a cute little bookshelf to the side of the kitchen where she put some fun literature, accented by a vintage tea set and wall clock. She also had artwork by local artists in the bedroom that were made available for sale, which I thought was a nice "local" touch! 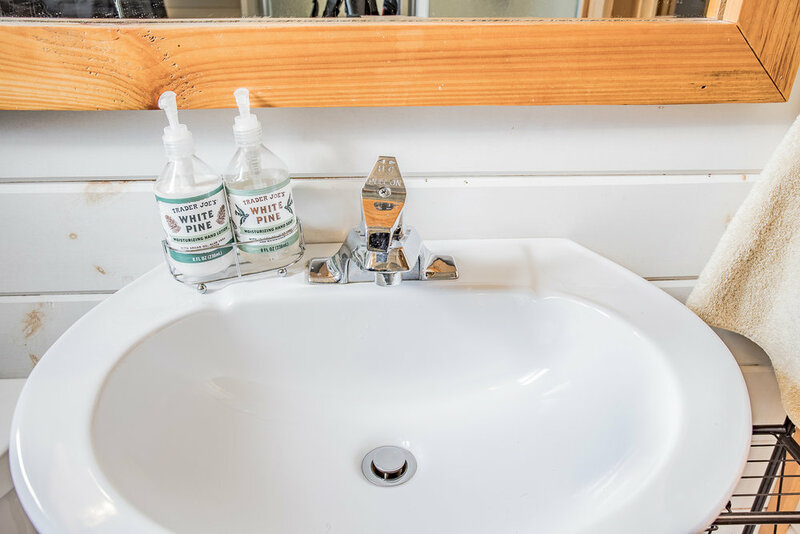 Even details as small as scented soap/lotion in the bathroom can come a long way, I thought the Trader Joe's "White Pine" scent added such a nice touch and went along perfectly with the environment that the host was trying to create for her space. We had an excellent weekend getaway, and would highly recommend this Airbnb to anyone looking for a place to stay in Glenville!